It is not uncommon that we offer behavioral advice during your cat's exam. Cats are fascinating and mysterious. What cat parent doesn’t feel intrigued or wonder— “Why does my cat ___________?”. With our extensive knowledge about cats, we will be able to answer your questions. To better understand “feline ways,” we recommend that you learn how to read your cat’s communication. Cats communicate by visual, tactile, olfactory (smell), and auditory means. Our feline friends have endearing special habits and ways of bonding with us (head butts, kneading, purring, etc.). Other habits are not so charming and can be challenging—even dangerous or destructive. These and some other common behavior problems can be difficult to tackle on your own. At Exclusively Cats, Dr. Dunkle and members of the veterinary staff can assist you and help to address behavioral concerns. We offer appointments dedicated to behavioral counseling. During these 45-minute sessions, we will ask you a number of questions to uncover what is going on. Once we get an idea of just what we are dealing with, we may run tests to make sure the behavior in question is not the result of a physical or medical problem. For example, litter box aversion may be traced to urinary problems. For some senior cats, behaviors could be attributed to the aging process. For example, perhaps the litter box sides are now too high for arthritic legs or back, causing accidents. Because each cat is unique, the solution to their behavioral problem may take some trial and error, but with your efforts at home along with our support and advice, most problems can be solved. First, we evaluate your cat’s personality and traits. Then we apply this to the information that you share about your cat’s environment in order to decide which behavioral techniques and products we should try first. Medications are sometimes added to the therapeutic mix, but again only based on the traits of your individual cat. And, of course, if your cat is not spayed or neutered, we will strongly recommend that this surgery be done before extensive behavioral measures are tried. We understand that reversing a behavioral issue can be frustrating. Consequently, as we work through the counseling process, we’ll be sure to offer plenty of resources to assist the cat parents dealing with the undesirable behavior. Above all, our goal is to ensure that you and your cat live together harmoniously and that your household is a happy one. 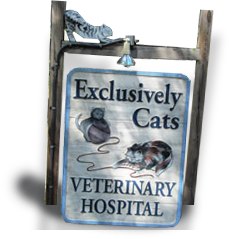 If you are experiencing issues that are impacting your enjoyment of your feline friend, we urge you to contact us today.